Hot Diggity Dog! | America loves Sporks! ← For the love of Jesus! The appearance of the shredded cheese pretty clearly says to me “microwaved”. 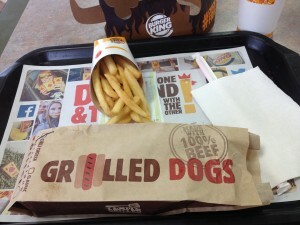 The “grilling” of the hotdog occurred in a factory somewhere in Kansas, if not Mexico. 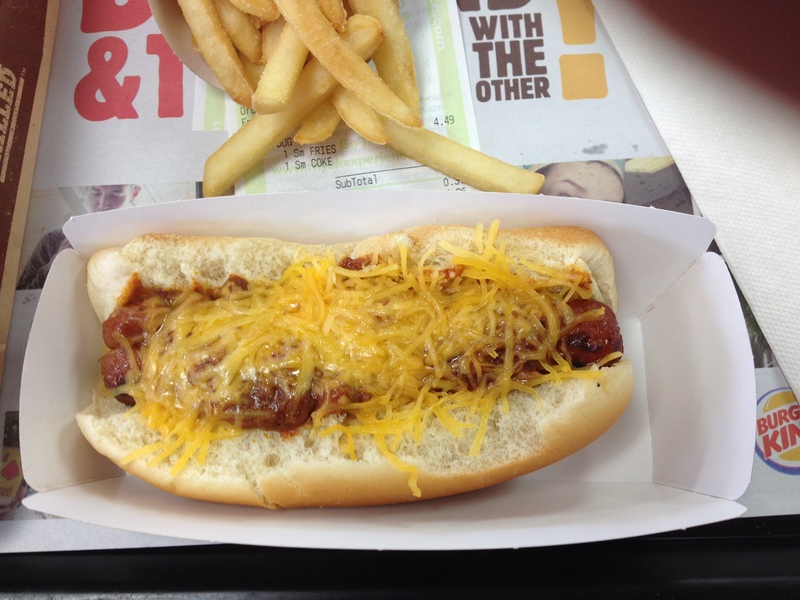 The hotdog itself is small, the chili had beans (a no-no for some parts of the country). The disappointing part is the french fries. They still seem to be using oleophobic coatings to keep the potatoes from absorbing the “healthy” oil. They taste like eating flour paste. Michelle Obama is not your customer, I am. They are also making the same mistake as McDonald’s – their menu is out of control. It has been a long time since I have been here. There are eight different desserts, 16 different combo meals, the 5 for $4 special, the 2 for $5 special, the 10 chicken nuggets for $1.49 special. I didn’t want to interrupt the manager doing her personnel work in the dining room to ask if the have milk that isn’t nonfat in hermetically sealed jugs that don’t need refrigeration and will survive nuclear war. Want me to come back ever? Fry the potatoes in animal fat and demand that Coca-Cola offer soda using cane sugar, not HFCS and/or stevia. This entry was posted in Unauthorized Food. Bookmark the permalink. 10 Responses to Hot Diggity Dog! Do any of the fast food joints have apps yet where you can make your complicated menu selections, finalize your order, pay confirm a pick-up time? With the mapping technology, it would be easy for them to estimate how long it will take from your present location to the store and allow you to confirm it or modify it so that you can bypass waiting in ling. The Starship Federation is working on a prototype for the replicator. It may take a while to get the bugs out. Until then, try the Sonic on Forest Point Boulevard. It is not too far from the SC amusement park. Hardees sells hotdogs and has since my brief employment there in 1972. The competitor in North Carolina is a chain called cookout – growing quickly. Definitely will be confusing to people in Boston. The objective is confabulation. Hmm. We just went to BK and my dog was $1.99 for the classic dog. The fries are not the best, but they will do. Can you get them cheaper? – yes. Can you get them better? – yes. Don’t forget, however, that folks don’t go to fast food places for healthy or gourmet foods. The company that currently owns Burger King also owns Kraft, Oscar Mayer, and Heinz – so they can control the whole ball of wax. P.S. McDonalds started a Kale salad in Canada for “healthier” eating. It has more fat and calories with all of the stuff on it than a Big Mac. The Weiner wars are underway. 7-11, Rally and Weinerschnitzel have launched counter attacks.